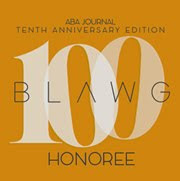 Readers may recall our commentary on a recent audit by the Department of Justice re the Office of the Pardon Attorney (see post here). It essentially involved a great deal of hand-wringing over delays in the processing of clemency applications. All sorts of figures were then presented, in tables, showing just how many days on average, applications remained in this or that office in the Department of Justice, or at the White House. What the report failed to note is that one out of every two pardons and commutations of sentence granted over the last 39 years has been granted in the month of December. 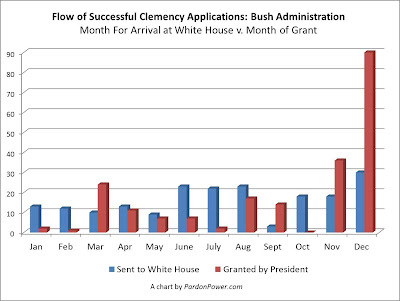 The chart, above, shows which months of the year, pardon applications with positive recommendations were submitted to the White House during the Bush administration (blue bars). It is clear that, while not many positive recommendations were made, they were distributed throughout the twelve months of the year. December represents only a slight bump up. On the other hand, the actual grants of clemency (red bars) were not at all evenly distributed. 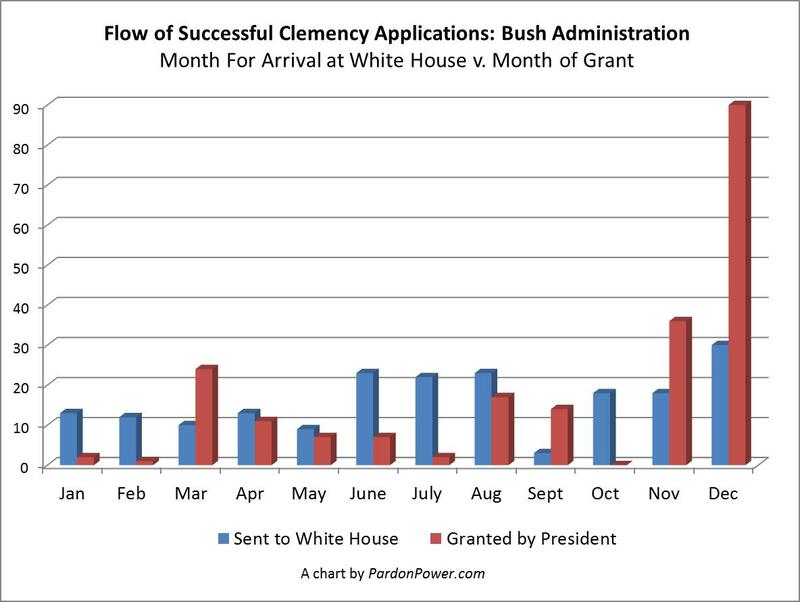 The Bush White House clearly sat on clemency applications with positive recommendations and dumped them, primarily, in the months of November and December.